Zapata County vital records, maintained by the county clerk in the town of Zapata, can be ordered by mail, phone, fax, or in person. Duplicate copies have been filed with the state since 1903 and can also be obtained online through TexasOnline, the official state website. Informational copies are unrestricted, but certified copies are restricted to qualified applicants for 25 years (death certificates) or 75 years (birth certificates). Located in southern Texas, Zapata County experienced an influx of Anglo-Americans after 1980. 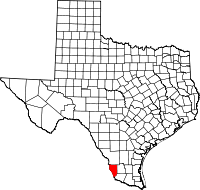 The county was formed from Starr and Webb Counties in 1858 and was inhabited by the Coahuiltecan Indians prior to Spanish pioneer ranching in the 1750s.